There are a couple companies trying to scam student loan borrowers. One company is called US Direct Student Loan Services. They are NOT a contractor of the US Department of Education Direct Loan Program. Their ploy is asking for up-front money for a loan consolidation application fee! DO NOT pay to consolidate Federal Direct Loans. It's free. If you have a Carroll College Perkins Loan it will be serviced by University Accounting Services. If you ever have questions about the legitimacy of a call, Email, or letter, feel free to contact the Financial Aid Office and we'll check it out for you. Our direct number is (406) 447-5425. Always be on your guard! Do you Know Where your Federal Loans Are? 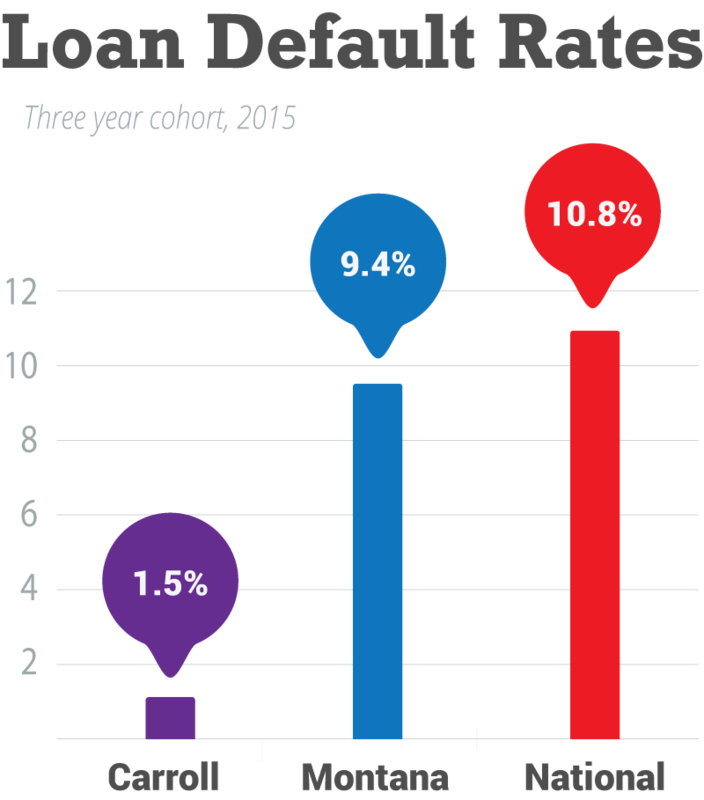 Preventing default on your federal loans begins with knowing who your lenders are, and maintaining accurate records. To review a complete listing of your federal loan history go to the NSLDS website. Do you need information about loan repayment options? The U.S. Department of Education offers numerous repayment options for federal student loans to assist borrowers in avoiding default and to encourage successful loan repayment. Visit the StudentAid.gov website to review the payment options. Repayment options include Standard, Graduated, and Income Based Repayment plans. Income based repayment plans have certain eligibility requirements that the borrower must meet. Do you need information about consolidating your Federal Loans into a single servicer? With the recent changes in Federal Loan regulations, your loans may have been sold to a variety of servicers. It is your responsibility to understand who is servicing your loans during repayment. To simplify the repayment process, you may want to consider consolidating your federal loans into one servicer for ease of repayment. Do you need information about Federal Loan Repayment Forms? You may visit the Federal Department of Education Loan Services website to access commonly used forms for borrowers. Are you looking for information that will assist you with maintaining proper credit and repayment status? Visit the Federal Student Aid website for tips to remain in good standing and prevent loan default. Are you looking for information on how to managing your debt? Read through this helpful Federal Student Loans Guide. Are you looking for examples of monthly payments based upon the loan amount borrowed? The first step in preparing for loan repayment is to know what your monthly payments will be so that you may start planning for repayment. The loan repayment estimator listed on this page provides examples of monthly loan payments under each of the available federal loan repayment plan options. Please check with your lender for your specific loan repayment details. Carroll College students graduate with an average loan debt of $24,828 in federal student loans. Do you want information about how to view your credit score? A healthy credit score is important to maintain. Your credit score can impact your ability to secure a line of credit for major purchases such as a car or your first home. Adverse credit (late or delinquent payments) can negatively affect your credit score. On-time payments can positively affect your credit score and may help in securing a better interest rate on loans. Consumers may receive one free credit report each year. To access your free credit report visit the Annual Credit Report website. Did you graduate with a degree in Nursing? If so, you may be eligible for the HRSA Nurse Corps Loan Repayment Program. For more information, review the HRSA Nurse Corps Loan Repayment Guide.